Every kid should have their daddy be their first super hero. When one of our friends, a dad of 8 kids from one wife (wow), owns a business, helps in home-schooling his children, is a Godly man who on top of it all, has a great sense of humor and a love of all things dress up! So when his birthday came up, my son (who is friends with his boys and attends bible study over there weekly) insisted that the card Mr. Cragoe needed was a Super Hero card! Yes, we have a stamp set for that! Join me in making this fun card to celebrate a fun dad. Our friend loves masks and dressing up - he's a hoot! 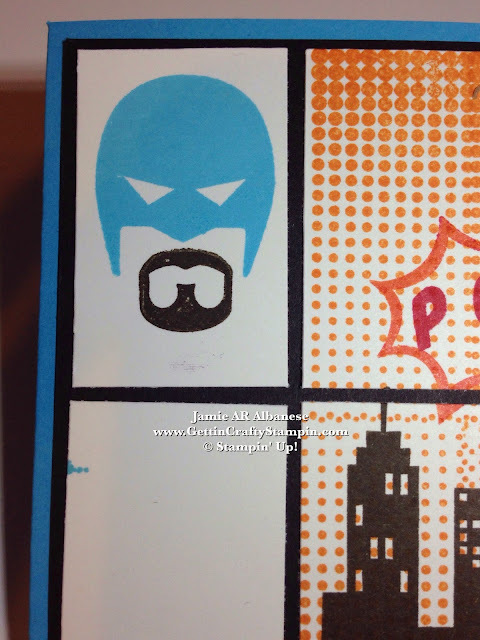 This card takes it to the masculine level when you stamp this Pacific Point mask and add the facial hair. I stamped this whole image collection on one sheet of Whisper White card stock (3-3/4" x 5"). 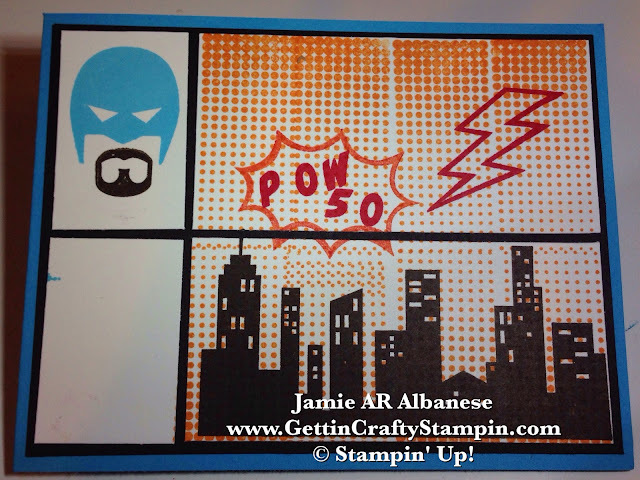 Stamping the dotted background in Crushed Curry to mimic an actual comic book. Stamping the building and facial hair in Early Espresso ink. 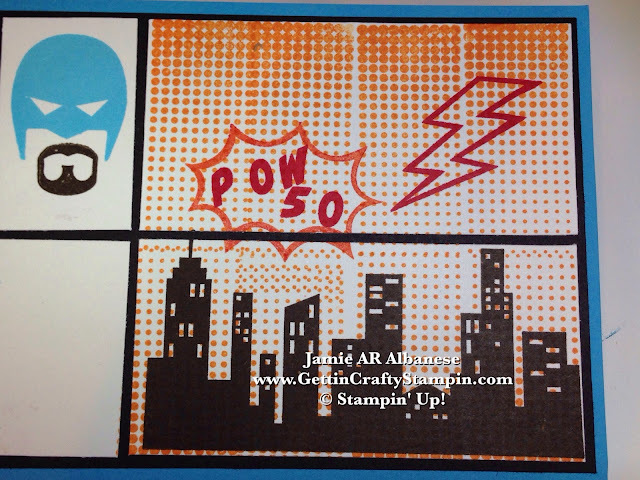 Stamp this lightning bolt and POW 50 saying in the Real Red ink and the Zap type box in Tangerine Tango. (I pulled these colors from the Color Coach in color suggestions for Real Red). 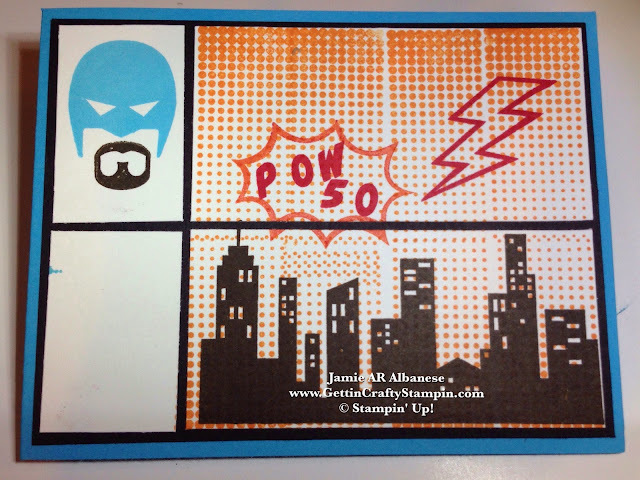 Cut the hand-stamped Whisper White card stock to highlight the various areas and mimic a comic book when you lay it over the Basic Black card stock (5-1/4" x 4"). 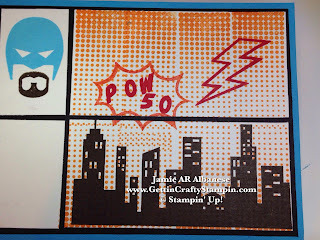 This awesome stamp set is super fun, flexible, easy to use and great for all ages (kids to kids at heart)! From Birthday to Congratulations to Parties you can create an unlimited amount of cards and decorations! 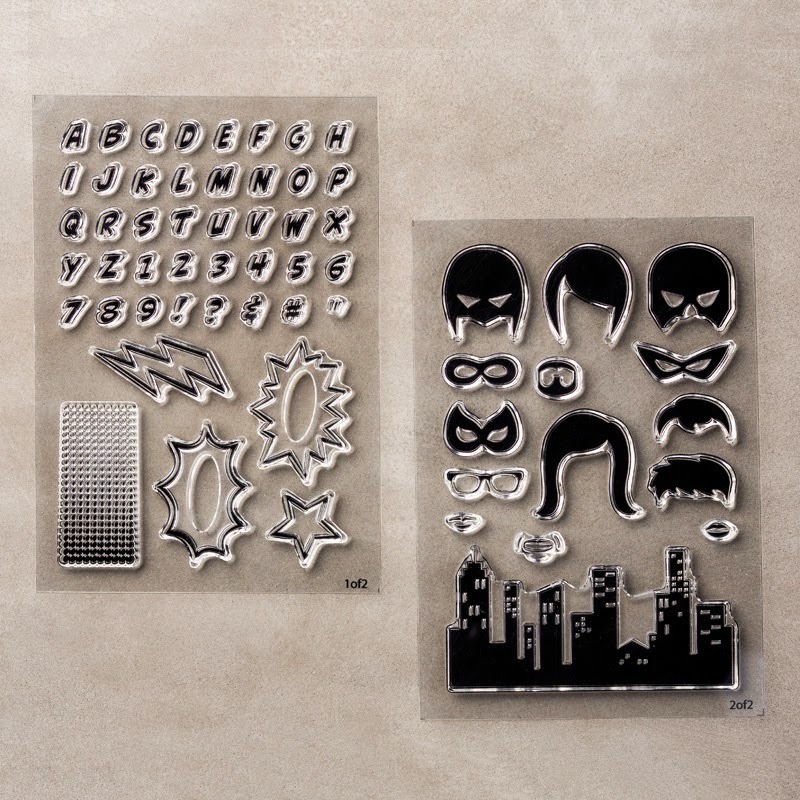 Deliver a Super Hero Birthday Wish with this fun stamp set! Here a dad turns 50 - yet is a kid at heart. Creating a fun card that celebrates him and his love of masks (lol) and all that he does for his family, friends, church and work... it's a blessing to have good people in your life! Have fun in your paper crafting and card making with a stamp set like this and deliver smiles for the young and young at heart, male or female.